1) What do you see as the benefits of ovary freezing vs. egg freezing and vice versa? For cancer patients, ovary freezing can be done immediately and not delay chemotherapy of bone marrow transplant by more than a few days. To get enough eggs for reasonable confidence of a high likelihood of pregnancy for egg freezing would require three cycles and possibly six to nine months before she could undergo her cancer treatment. For non-cancer patients, they may prefer one laparoscopy to multiple cycles of ovarian stimulation for egg freezing. Also, many programs do not have great egg freezing, and the patient may have a hard time discerning this. Certainly for cancer patients, all the babies born so far, over 30 have been from ovary tissue freezing, not from egg freezing. 2) Are there particular women whom you would recommend ovary freezing for? How does a woman weigh all her options? The above answer sort of answers this also. For cancer patients, ovary freezing is clearly the best. But if it is a leukemia case the freeze should be after her chemotherapy and before she signs up for a bone morrow transplant. That way there will not be cancer cells in her ovary. 3) How many births have you had from ovary freezing? We have had 14 births from fresh ovary and three out of three births from frozen ovaries. 4) If a woman is interested in the procedure, what should she look for in a fertility doctor or clinic? An interview should tell her right away if they have any idea what they are talking about. 5) How long has your clinic been doing egg freezing? Since 2003, first in the United States to use vitrification. 6) Who are you offering egg freezing services to? What types of patients? Both cancer cases, autoimmune cases, and freezing just to extend the reproductive life span and for what some might call social reasons. 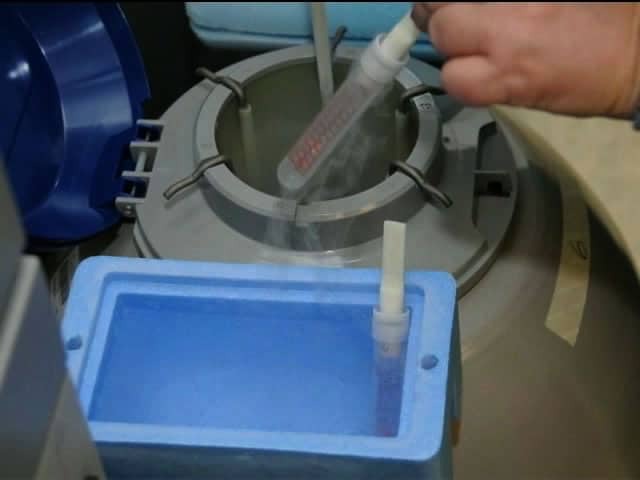 7) What does your fertility clinic consider the optimal age for egg freezing? What are the criteria? We would prefer a patient who is 21 to 25 years old, but that never happens. Usually they wait until they are over 35, which is not ideal. 8) Once eggs are frozen, where are they stored? All eggs and ovarian tissue are stored at our carefully guarded and monitored lab at St. Luke’s Hospital. 9) How long do you feel eggs can be stored safely? 10) Is there a cut-off age that you recommend for women to have eggs thawed, fertilized and transferred in a cycle? No cut-off age. If healthy and a good extended family, age does not matter. 11) Has your fertility clinic had live births from frozen eggs? Of course. But no cancer cases yet. Nor does anyone else. 12) What is the price range for freezing eggs, and what does that range cover? Each cycle is $6,000. So for three cycles, it would be $18,000. For ovary freezing, it is free for cancer cases, and a few thousand dollars for social cases. 13) What are the reasons a woman would NOT be a good candidate for freezing her eggs? Please include ovary freezing in all your questions, as it is so much better for so many patients. Metastatic tumor to ovary, or personality disorder in the patient would be a contraindication. 14) What is the most exciting aspect of ASRM lifting the experimental label? How do you think this will change the face of fertility treatment? ASRM was stupid and three years late for this. We had written an editorial in the Fertility & Sterility medical journal about this three years ago. They were dumb and had people who knew nothing about vitrification making their dumb previous decisions. Now their present decision is also dumb, in that they don’t make ovary freezing non-experimental, even though we have around the world over 30 babies in cancer patients from frozen ovary tissue, and zero from frozen eggs. 15) What should a woman look for in a clinic that does egg freezing? “Can they also do ovary tissue freezing” is the biggest question. Also, are they a big institution? How can the patient know they will still be around in 20 years? Have they published scientifically on the subject? The videos below would help, too.